If you missed our telephone town hall meeting on Thursday, March 21, read the recap of what was discussed below. Victory! Victory! Victory! This week we were proud to announce that we reached an agreement with the Pritzker administration over the implementation of our 48-cent raises and the release of back pay that PAs are owed. PAs won the 48-cent raises in the 2017 budget compromise and they were set to take effect on August 5, 2017. Our former governor, Bruce Rauner, broke the law and refused to implement the raises so our union took him to court, and PAs took action all across the state to demand the money and to make sure that everyone in our communities knew what Rauner was doing. Since our new governor, JB Pritzker, took office, our union has been in discussions about getting our raises implemented and our back pay released and this week we were pleased to share the agreement that was reached. Under this agreement, our 48-cent raises will be implemented starting in April, which means that PAs will see the raise appear on paychecks in May for the hours worked in April. Until the raises are implemented, back pay will continue to add up in our escrow account. Our agreement with the new administration also creates a timeline for the release of more than $29 million in back pay for PAs that’s been collecting since August 5, 2017. The State has committed to ensuring PAs receive the back pay they are owed by the end of the fall. There is also news out of this agreement about the terrible overtime policy that Bruce Rauner implemented in 2017. We know that this policy has been very hard on people with disabilities and Personal Assistants and that’s why our union and disability advocates have fought it every step of the way. Under our agreement, the State will stop enforcing the policy until we get back to the bargaining table and can negotiate a new policy that won’t hurt PAs or people with disabilities. In addition, any occurrences that PAs received will be thrown out altogether. This is excellent news! Just as a reminder, the only PAs that are impacted by this are those who have consumers with care plans that require more than 45 hours per week. If your consumer does not have a care plan that allows you to work more than 45 hours, then the overtime policy did not impact you. But, for those who have consumers with care plans that allow for more than 45 hours per week, there will be no cap on hours enforced until we come to agreement on a new policy through negotiations. We will bargain over the new policy and disability advocates will play a big part in deciding what it looks like with us. We are ready to fight for the best policy possible – one with a higher cap and much more flexible exceptions, and one that supports consumer choice and doesn’t punish PAs. Our raises and the overtime policy were our top two priorities to address in 2019. Now, we can finally turn the page on some of the destruction that Bruce Rauner left behind. Pritzker followed through on an important commitment he made to our members so we can start to rebuild the Home Services Program, and the reason he followed through and did the right thing is because of the thousands of PAs and people with disabilities who took action through our union. No one has ever handed us anything – we have had to fight tooth and nail for every victory we have achieved and this is no different. While Bruce Rauner was in office, negotiations over our next contract were stalled. Rauner demanded a wage freeze and wanted to eliminate our health insurance and training program, which would have hurt PAs and our consumers. There was no way we would agree to his demands and that meant we had to extend our old agreement so our rights were protected. Now that we have a new governor, we are gearing up to get back to the bargaining table and to make real progress. Soon, bargaining surveys will go out to every Personal Assistant who is a union member so you can weigh in on what our top priorities should be. As we look ahead to contract bargaining we are really thinking about the kind of home care programs, home care jobs, and the kind of communities that we all have a right to. Home care programs don’t currently have enough funding so many Illinoisans who need services cannot get them. And too many PAs are forced to leave the industry because they are unable to support themselves and their families. We must demand that our elected officials invest in home care now. That means both expanding services and improving wages and benefits for workers. Every PA should earn $15 per hour right now, and every PA should have access to affordable health insurance, paid time off, and options to save for retirement. And every senior and person with a disability should have access to the housing and home care services that they need so they can remain living in our communities. Keep an eye out for your bargaining survey and be sure to make your voice heard. We have a lot of work ahead to transform Illinois home care so that we can all thrive and we need every PA standing with us. In order to achieve our vision for a better Illinois home care system, we must demand that the resources our state already has are used to improve our home care system. But, we also need to demand that those top earners in our state pay their fair share. A fair income tax is something our union has long supported because it is not fair for a home care worker to pay the same flat income tax rate as a millionaire. We are pleased to see that Governor Pritzker is getting to work right away on following through on his commitment to pass a Fair Tax in Illinois and he’s going to need our help. Stay tuned for opportunities to get involved! This year we are expecting the Trump administration to implement a new rule at the federal level that will take away our right to pay our union dues directly from our paychecks as we always have. We know that this change is just an attempt to deny home care workers our choice to join together in our union, but we will not be stopped by the Trump administration or the right-wing corporate front groups that are pushing this change, like the Illinois Policy Institute. This attack is meant to stop us from sticking together for higher wages, better training, and better benefits. We cannot allow this change to take us backward and that’s why we’ve been preparing for it. When this new rule is announced we will challenge it in court to make sure that every home care worker continues to have the right to join together in a union. 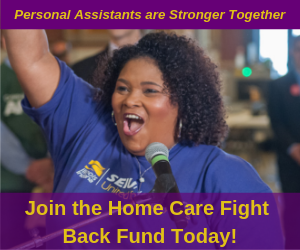 We also launched the Home Care Fight Back Fund, which establishes a new way to support our union and pay our union dues. All PAs are encouraged to join right away to ensure there is no interruption in your union membership, just click here to join! We will talk about all of these updates and more at our March 30th membership meetings. Click here to view the details and attend the meeting happening in your area.